Ms. Friedmann is a violinist and violist, whose broad-ranging career has included tours in Japan, Europe, South America and the United States, performances with New York’s most prestigious musical ensembles, and a special onstage role on Broadway. The New York Times praised her “fiery spirit” after her Carnegie Recital Hall debut. As a regular member of the Orchestra of St. Luke’s she has performed classical symphonies in Carnegie Hall and rock’n’roll alongside “Metallica” in Madison Square Garden. She made her Broadway debut as the violinist in Shakespeare’s Merchant of Venice, which starred Dustin Hoffman. Ms. Friedmann performed with the Soni Ventorum Quintet on the world premiere recording of William O. Smith’s “Jazz Set for Violin and Wind Quintet.” Ms. Friedmann is featured as both violist and producer on the CD Classical Music with a View: Islands and Vistas. 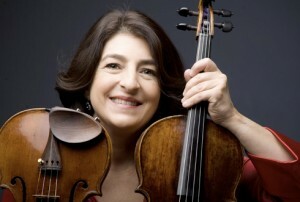 Ms. Friedmann has been an Affiliate Artist of Viola at the Moores School of Music at the University of Houston and performs regularly with the Houston Grand Opera orchestra. She was also acting concertmaster for HGO’s world premiere performances of Jake Heggie’s The End of the Affair. Trained at The Juilliard School and the University of Washington, Friedmann plays on a Grancino violin and a Grancino viola.